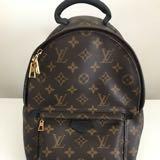 100% authentic preloved LV Palm Springs Backpack in great condition. Very chic yet sporty backpack, ideal for urban fashionistas. Purchased in 2017, the bag has no damage and has very clean interior. Features: Monogram coated canvas, soft calfskin trim with foam backing, padded leather top handle, adjustable padded shoulder straps, black nylon lining, golden colour metallic pieces, double zip closure with engraved pulls. Dimensions: 22.0 x 29.0 x 10.0 cm (Length x Height x Width) Comes with its original LV dustbag. RRP New (approx) AUD2840 Paypal payment only. Serious buyers only and no time-wasters, please.